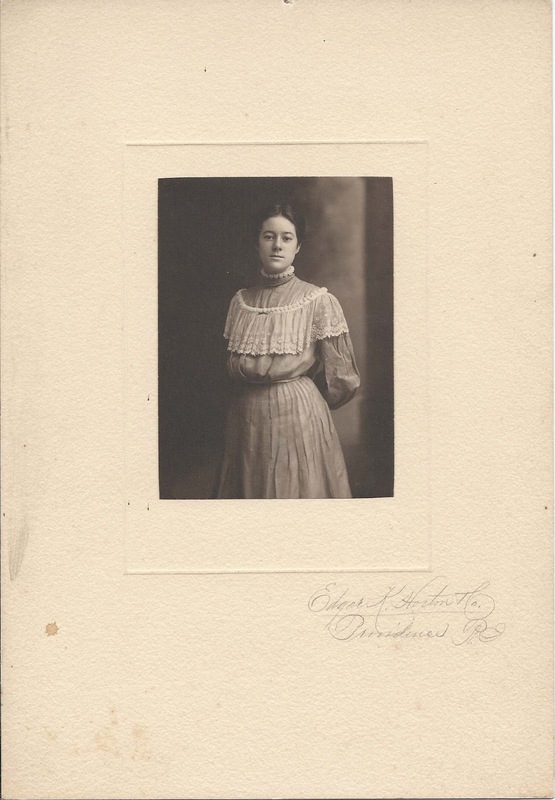 1905 graduation photograph of Florence Dombey Colwell, a student at Technical High School at Providence, Rhode Island. 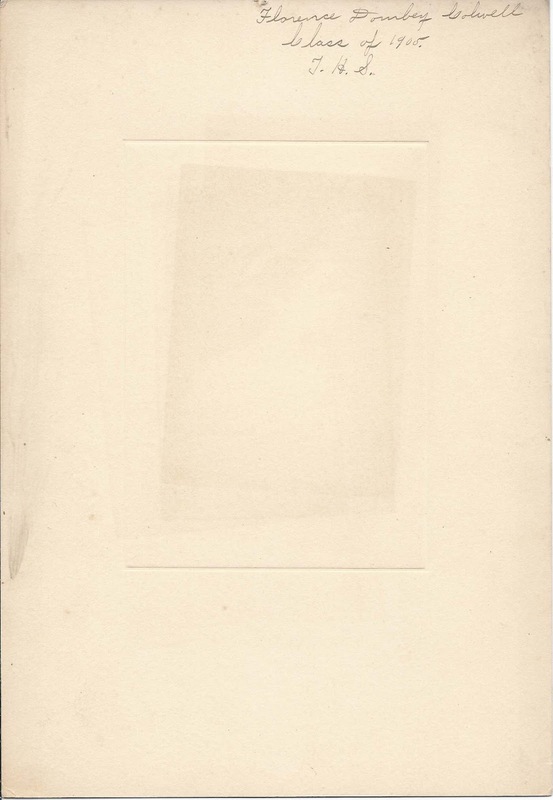 The photograph itself is 4" x 3"; the entire piece is 10" x 7". It was found with 15 similar photographs of 7 young men and 8 other young women. Most, if not all, of the photographs were taken by the Edgar K. Horton studio of Providence. Florence Dombey Colwell was born 29 May 1885 at Providence, Rhode Island, the daughter of Wilmarth Hannah Colwell and Ida F. (Horton) Colwell, who were born at Cranston, Rhode Island, and Providence, Rhode Island, respectively. At the time of the 1910 Census, Florence was living with her widowed mother at Providence and working as an enamel painter in a studio, perhaps her own studio. In 1920, she was living in a household headed by her brother Wilmarth Colwell, and working as a bookkeeper at a jewelry store. On 16 September 1922, at Providence, Florence Dombey Colwell married Fayette Reade Eldredge, son of Gorham L. and Julia Etta (Dill) Eldredge. Fayette was born 11 August 1883 at Chatham, Massachusetts. He worked as a draftsman. Census records show no children for the couple, though there may have been a child or children who didn't survive. The couple lived at Providence, Rhode Island, as late as 1942, when Fayette completed his World War II Draft Registration Card and indicated his employer was the General Fire Extinguisher Company. Fayette died in 1950, and Florence in 1954. They're buried at Seaside Cemetery at Chatham, Massachusetts.